In the middle of another election year, most Americans are aware that they must choose the “lesser of two evils” for president. As usual, no one seems to expect any significant improvement to come to their lives. However, the promises, or possibly the gender, political party, skin color or oratory skills of one candidate or another, will motivate voters to cast a ballot for them. Meanwhile, almost half of voting age Americans will not vote. Typically after being elected, some crisis or major distraction will gain the public’s attention so we don’t notice or mind when the winner doesn’t make good on his/her commitments. The public accepts this as “business as usual” and we move on. Usually, if the politician hasn’t committed a crime or sometimes even if they have, he/she isn’t held accountable for decisions made in office, regardless of how they affect people’s lives. Recently in Chicago, Mayor Rahm Emanuel has come under fire for the murder of innocent people by police. This is an interesting turn from the usual demands that the murderer be held accountable. Normally a politician is able to escape accountability in such situations under the premise that the cop was responsible for his/her own actions. 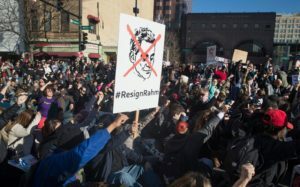 However, when intimidation, torture, wrongful imprisonment and cold-blooded murder of populations by the police become routine, as they have in Chicago, who are the victims to turn to? In indigenous societies, people live under a different governmental structure that is typically ruled by a traditional king and lesser kings (big chief and small chiefs). Under these structures, a king is responsible for anything that happens within his kingdom. There is no room for the king to try to escape responsibility. It would be seen as cowardly and irresponsible to do so. The king must exhaust his resources to solve any problem. In such societies, election of the king is not a democratic process. However, under this structure, the king’s job is to serve the people and ironically, he is more accountable to the people than the politicians in our democratic governments. The dogma we have been indoctrinated with, that democracy is the best form of government possible, needs to be reexamined when we find this form of government allows our leadership to lie and con their way into power with impunity while cheating and oppressing us… and we don’t think we should expect better? Instead of questioning the quality of our governmental structure, we question the individuals in power, saying, “If only he would do right.” Maybe the problem is: doing right isn’t his job in this system. Maybe it’s this democratic system that’s the problem. Many of us seem to be convinced that voting is the only way to bring changes to this system. We have been so convinced of the ultimate power of our constitution as the “SUPREME LAW OF THE LAND” that no alternative seems possible or desirable to the vast majority of us. We forget that Uncle Sam’s all-seeing eye and all-powerful gun only get their power from our support. What will be the power of the police siren be if nobody pulls over? What will be the power of a mayor if the people block his entrance to city hall?